Every year interior design styles change and we can see new trends emerging each and every time. They don’t change dramatically, the changes are usually subtle, evolved from previous trends. It also doesn’t mean that you have to remodel your interior every year, but if you like staying on the cutting edge of the latest design styles it’s worth keeping an eye on these trends. Today we’re looking into kitchen decor trends of the current year with 20 stunning examples and we’re looking for something to take home out of each of them. What we will see a lot in these stunning kitchen designs are soft hues of grey on the cabinets, walls and even floor. Grey is the new white this year, although white hasn’t been phased out entirely. Mixing materials is another popular feature and in some cases we get a lot of it. This particular kitchen mixes marble countertops, wood stools, hardwood floor, subway tiles, metallic fixtures and stainless steel. That’s a lot to combine but it works very well. Color and pattern drawn from feature walls (bricks in this instance) is a remnant from previous years but some things are just timeless. The washed out grey hardwood floor is gaining in popularity in particular. Contrast is very important and trendy, it works well while mixing different materials. The black chalk paint gives an amazing matte finish that contrasts with white walls so well. 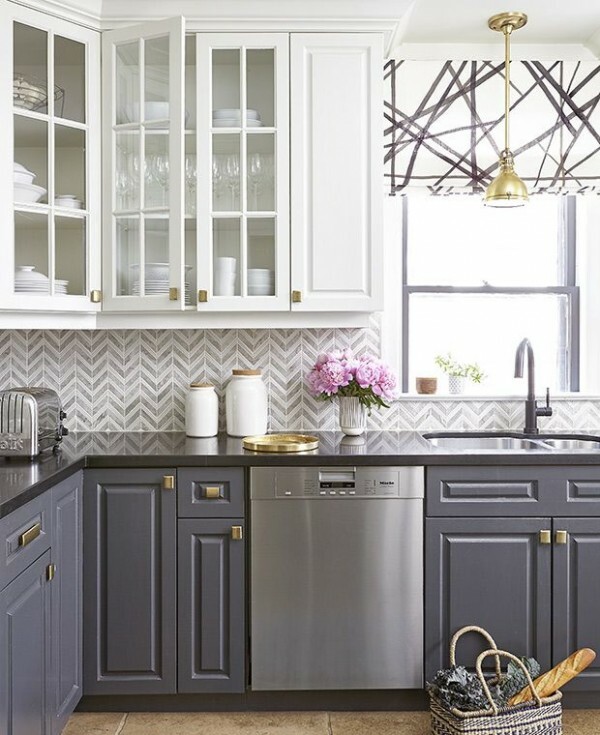 You’ll see a lot of mixing of metallic finishes, especially brass, silver and matte black. It’s not the first time metallic is used as a decor feature but it keeps gaining in popularity every year and we don’t see it going away anytime soon. Another great example – matching the lighting fixtures and drawer pulls. We find the ever so popular grey cabinets here too. A lot of contrast is being used in this kitchen design, with marble features and brass accents, including vases and stool spray paint job. The use of open shelves is another feature here to stay, especially in small kitchens. Suspended shelves allow more storage in limited space and provide surface for decorative display. More of the warm grey cabinets which look stunning when contrasted with architectural features such as crown molding. This kitchen design is truly stunning for many reasons. First, we have our favorite soft grey cabinets embellished with brass pulls and contrasted with marble countertops. Then we have even more contrast with black stainless steel appliances which also feature brass detail. The subway tiling with black painted grout create the perfect backdrop pattern and the large black granite floor tiling brings it all together. Despite the overwhelming presence of grey, white is till in, especially when contrasted with black features, such as countertops, sink, fixtures and other details. Matte black works just as well as brass does with grey cabinets and glossy white surfaces. Here we have matte black pulls, faucet and lighting fixtures. Mixing brass, silver, matte black hardware, grey cabinets and floor, and wood stools – proof that all of these materials complement each other in any setting. Brass works with whites and it’s still in too. It isn’t always just about painting cabinets grey too as we can find features such as using the concrete finish in this kitchen design. This design shows the transition between previous trends of whites and current soft greys – very soft greys are now replaced with more prominent hues. It isn’t always about neutral colors. In this design turquoise backsplash tiling makes a gorgeous feature. This kitchen design shows how important is contrast with a chalkboard accent wall and just a hint of grey hues with brass accents. Intricate pattern blacksplash tiling is another feature to look forward to, especially if it also features our favorite greys. Function is always so important, and we keep finding new innovative ways to make the kitchen more functional, easier to use and inspiring to cook. This drawer system shows a clever and very accessible way to store dishes.